What can Joel do for youR Event? The purest, most intimate kind of magic as everything happens just a few feet away from the spectators' eyes. Whether it is at a cocktail party, banquet, family or corporate gathering, Joel will entertain your guests with magic that is both amazing and fun. Perfect for cocktail receptions. Joel walks among your guests and entertains small groups of 2-10 people at a time. In this type of show, your guests sit casually around Joel as he delights them with amazing feats of magic. The audience members are not only spectators but participants in what quickly becomes an experience they will remember for a long time. A stand-up magic show where the whole audience is seated in a theater-like fashion. This show involves different magic acts suitable for medium to large audiences. To break the "fourth wall" that this setting might impose between the artist and his audience, Joel combines his impossible and fascinating magic effects with lots of audience interaction and participation. This type of show requires a "stage area" in front of the audience. This area doesn't have to be big or a stage proper. Also, depending on the size of the audience and room, a PA system might be necessary. Sound equipment requirements could be fulfilled by a system you might already plan on having at the event or available at the event's venue. Joel can also provide the necessary equipment at an additional cost. 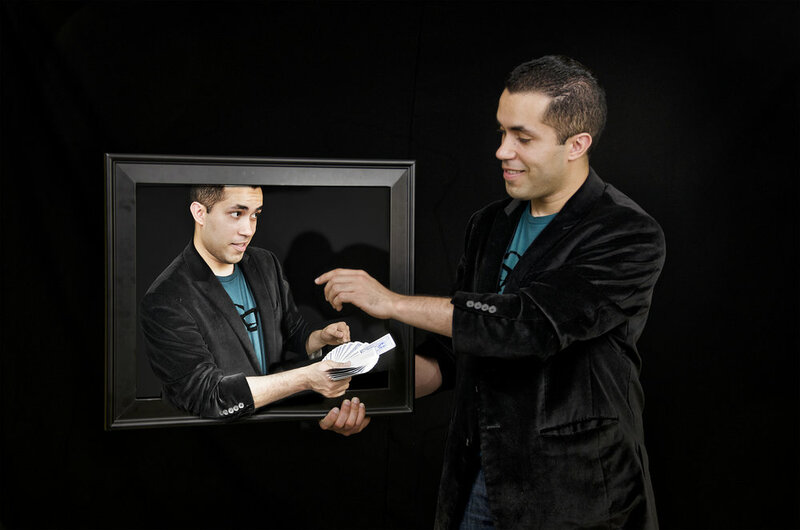 Voted Best Show in 2016 by the Boston A-list, Four-Handed Illusions features Joel Acevedo and Steve Kradolfer in two hours of magic and comedy for audiences 21+ years of age. Public shows take place monthly at Boston's famous Hampshire House. The show is also available for private events. Hire one of Boston's highest rated shows for your next event and give your guests a unique entertainment experience. Make the ordinary extraordinary by adding magical elements to your event.